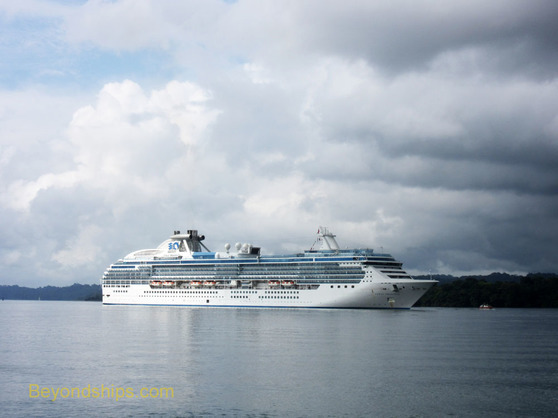 Coral Princess at anchor in Gatun Lake during a partial transit of the Panama Canal. A partial transit of the Panama Canal is where a cruise ship enters the Canal and exits the Canal through the same entrance (almost always the Atlantic entrance). Thus, the purpose of such a voyage is not to get from one ocean to the other but to see the Panama Canal. Typically, a partial transit begins before dawn with the ship proceeding down the Canal from Limon Bay to the Gatun Locks. Most of the passengers will have arisen already and will have secured viewing places at the front of the ship or on the upper open decks. As daylight begins to cover the area, you can see that jungle lies all along the Canal. 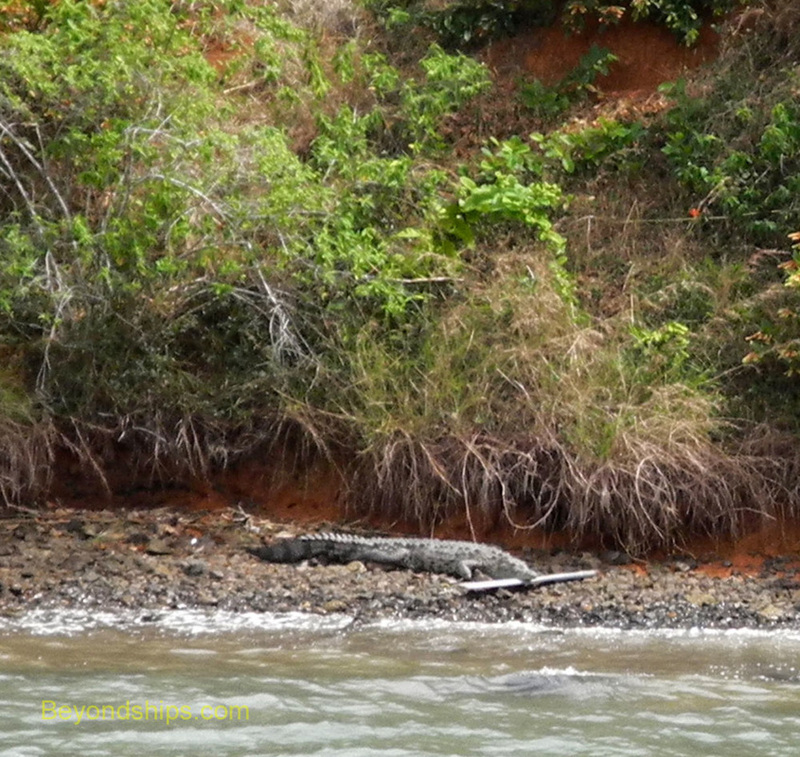 Look closely and you might see a tropical bird or a crocodile lying on the banks. Often an expert on the Canal will give a running commentary over the public address system or on the in-cabin television of the places of interest the ship is passing. On the starboard side, you pass Frenchman's Cut, the remains of the French attempt to build a canal in the 1880s. On the port side, you pass another cut that is the remains of an American project undertaken during World War II to expand the Canal. That project was terminated when the war ended but the cut is slated to be used in the current expansion project. Soon the ship reaches the Gatun Locks. This is a beehive of activity. Often there is another ship going through the locks either on the other side or in front of your ship. Automobiles and trucks race across a small moveable bridge in the interval between ships. Lines are attached to the ship and to the locomotives on either side of the lock chamber. The bridge swings away, the great doors of the lock chamber open and your ship moves forward into the lock. 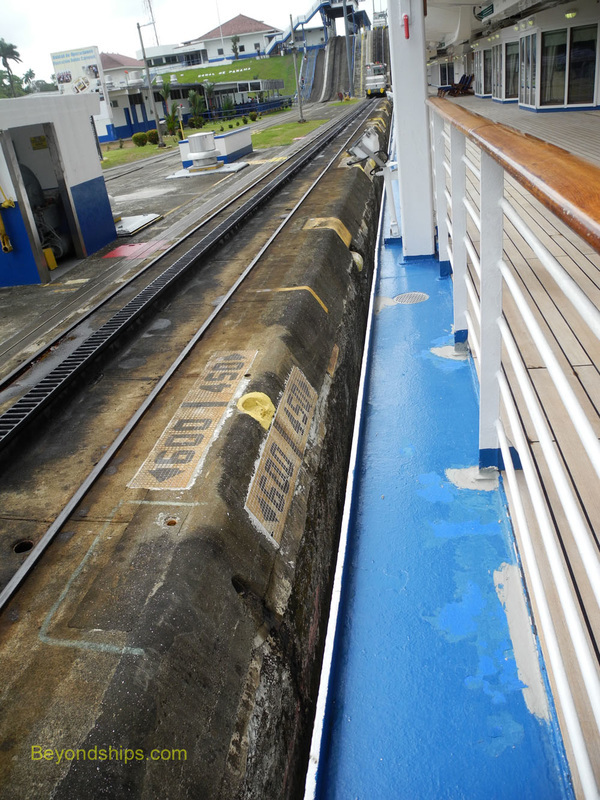 For most cruise ships transiting the Canal, the walls of the lock chambers are only inches from the side of the ship. It is an interesting experience to look out from the promenade deck or from a balcony and see nothing but wall. The ships warn, however, that it is dangerous to try and reach out and touch the walls. Tumults of water cascade into the lock chamber through tunnels. The ship rises until it becomes level with the stepped areas on either side. Now you can see the mules more closely as well as the administration buildings and the visitor center. When the water reaches the same level as the next chamber, the doors in front of the ship open and it sails into the next chamber. Once inside, the doors close and the process repeats itself. Typically, the ship will have landed some of its photographers before entering the Canal. They take up stations around the Gatun Locks and photograph the ship and its passengers as they go through the locks. 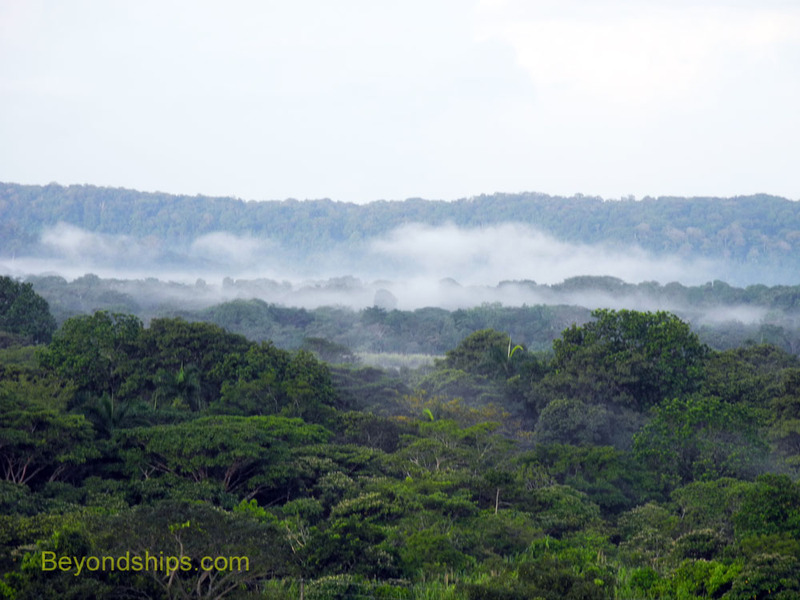 For those passengers standing on the open decks, it is well to remember that Panama is covered by a rain forest. There is a reason it is called a rain forest. Thus, it is a good idea to bring along an umbrella or some type of rain gear in case a passing shower. 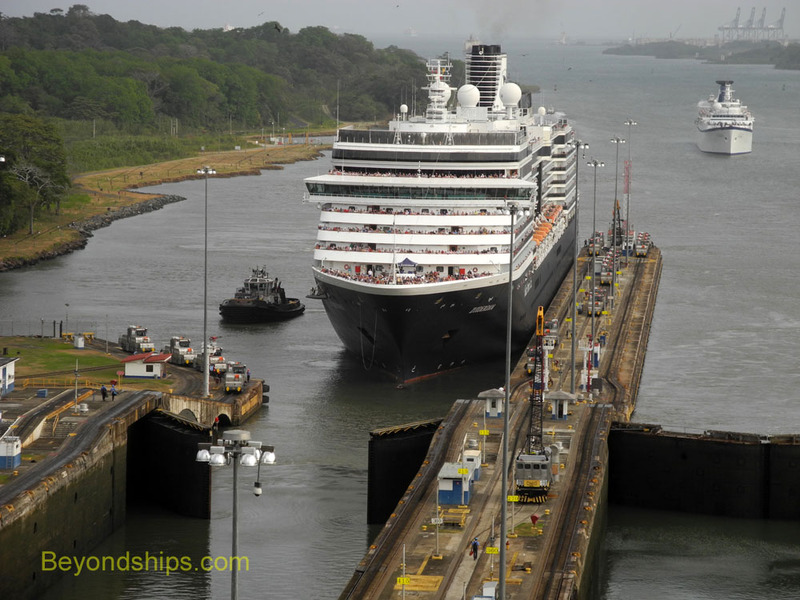 After going through the three chambers of the Gatun Locks, the ship sails a short distance and anchors. It will spend most of the day here before re-entering the Gatun Locks. Most passengers leave the ship here to go on shore excursions. In our experience, passengers can only leave the ship to go on an excursion as there are no facilities for independent travelers where the tenders dock. 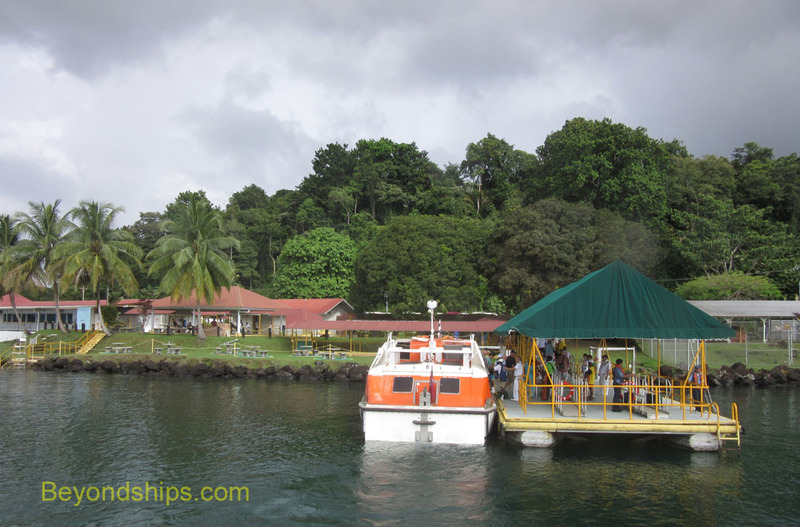 The tenders usually dock at the Gatun Yacht Club, which has a small pier and a parking lot for tour buses. There is no nearby town. Not surprisingly, most of the shore excursions focus on the Canal. Typically, there is a tour boat that takes passengers through to the Pacific exit of the Canal. There are often coach tours that take passengers to the visitor centers at the Miraflores Locks or the Gatun Locks to watch the locks in operation from the land. 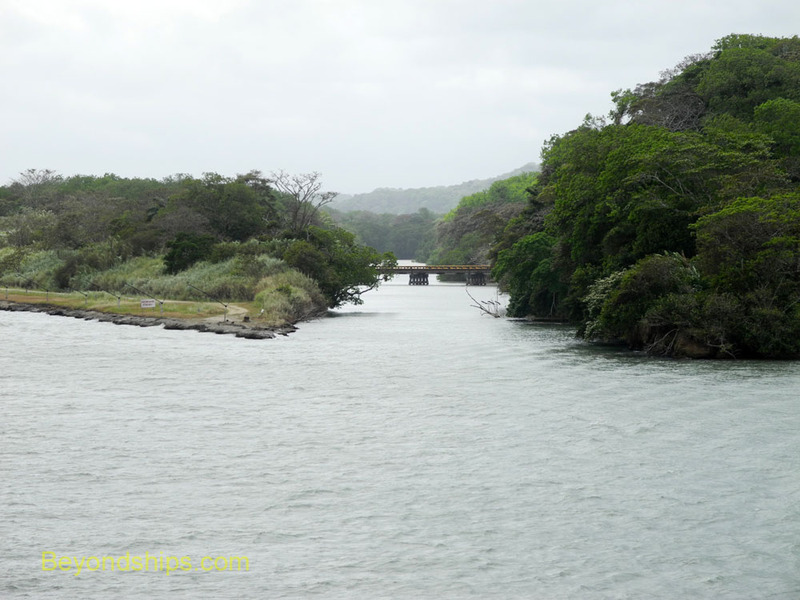 Some lines offer kayaking in Gatun Lake. There are also excursions that look at other aspects of Panama. Tours often go to Panama City. Some cruises offer tours that take passengers to an Emberra Indian village where the inhabitants still live in the traditional manner. In selecting a shore excursion it is important to keep in mind that the ship will not arrive at the place where it picks up its passengers until late afternoon. Thus, if you select an excursion that begins in the morning and only lasts four hours, you may have to spend most of the day sitting around the cruise terminal in Colon waiting for the ship to appear. There is not much to see there. For those passengers staying aboard, it is usually a quiet day with some typical sea day activities on offer. In addition, you can watch the parade of ships sailing through the Lake. It is a procession of all types of ships and you never know what you might see. 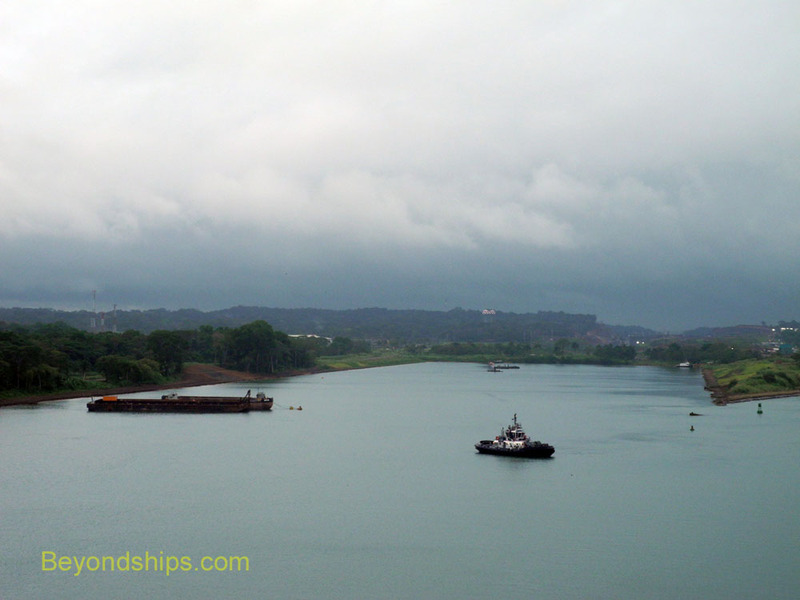 Towards mid-afternoon, the ship ups anchor and re-enters the Gatun Locks. The process is much the same as before except the ship is going down the steps rather than up. By late afternoon, the ship will dock at the cruise terminals in Colon. As already indicated, the purpose of this port call is to pick-up the passengers who left the ship to go on shore excursions. If the ship arrives well before all of the excursions have arrived, passengers who have remained aboard are sometimes allowed to explore the shopping area around the cruise terminal.. Above: The area surrounding the Canal is a thick rain forest. Below: A crocodile on the banks of the Canal gnaws on a piece of wood. Below: A remnant of the 1939 project to expand the Canal. Below: There is not much distance between Island Princess and the sides of the lock chambers. Above: A tender from Coral Princess at the Gatun Yacht Club disembarking passengers going on shore excursions. Below: Island Princess returning through the Gatun Locks.